The scleral expansion band procedure is a therapy for ocular hypertension and primary open-angle glaucoma (POAG). The scleral expansion band procedure reverses presbyopia and increases the baseline tension of the ciliary muscle, which increases the trabecular meshwork pore size. By increasing the pore size, the scleral expansion band procedure becomes a new therapeutic and preventive modality for ocular hypertension and POAG. Caution should be used. This procedure is an investigational device and, as such, is limited by US law to investigational use. For excellent patient education resources, visit eMedicineHealth's Eye and Vision Center. Also, see eMedicineHealth's patient education article Ocular Hypertension. Why does the incidence of ocular hypertension and POAG begin predominantly when patients are in their 40s? Is the simultaneous occurrence of presbyopia coincidental or does the development of presbyopia, ocular hypertension, and POAG have a common underlying etiology? Why does a small linear increase in intraocular pressure occur with age in the normal population? This is shown in the image below. 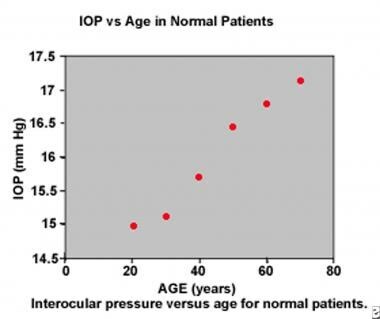 Intraocular pressure versus age in patients with normal intraocular pressure. Why does a parasympathomimetic medication, such as pilocarpine, produce a dramatic decrease in intraocular pressure in patients with ocular hypertension and POAG but only induce a minimal decrease in intraocular pressure in healthy patients? Increased aqueous inflow is not the cause of ocular hypertension or POAG. Ocular hypertension and POAG are caused by a decrease in aqueous outflow. Aqueous outflow is controlled predominantly by trabecular meshwork pore size. Davanger examined the relationship of pore size to intraocular pressure using a hydrodynamic model. He found that as pore size decreases, intraocular pressure increases according to a hyperbolic function, as shown in the image below. 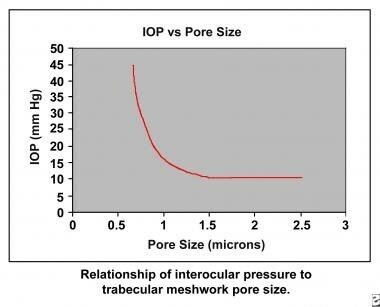 Relationship of intraocular pressure to trabecular meshwork pore size. Because the crystalline lens equatorial diameter increases throughout life, the baseline tension on the ciliary muscle decreases with age. A simple analogy can be made to the change in the baseline tension of the biceps muscle as the forearm is moved passively from the extended to the flexed position. As the forearm is flexed passively from the extended position, the baseline tension of the biceps muscle is decreased in a linear fashion, as shown in the image below. Passive flexion of the forearm reduces the baseline tension of the biceps muscle. This is analogous to the reduction in baseline tension of the ciliary muscle secondary to the age-related equatorial growth of the crystalline lens. Although the ciliary muscle is generally considered to be smooth muscle, it resembles skeletal muscle, and as the crystalline lens equatorial diameter increases with age, the baseline tension of the ciliary muscle is decreased. Because the trabecular meshwork pore size is directly related to ciliary muscle tension, as the baseline tension of the ciliary muscle decreases, the pore size decreases in a linear fashion with age. 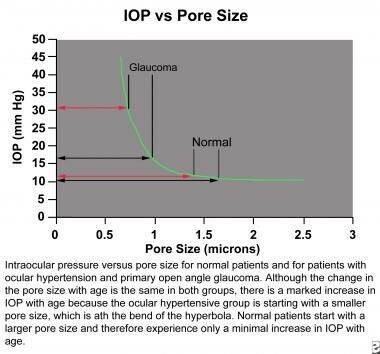 Intraocular pressure versus pore size for patients with normal intraocular pressure (normal) and for patients with ocular hypertension and primary open-angle glaucoma (glaucoma). Although the change in pore size with age is the same in both groups, because the group with ocular hypertension is starting with a smaller pore size, which is at the bend of the hyperbola, a marked increase in intraocular pressure with age is present. Patients with normal intraocular pressure start with a larger pore size and, therefore, experience only a minimal increase in intraocular pressure with age. On the other hand, patients with ocular hypertension or POAG have inherited small pores or a protein that effectively makes the pore diameter smaller. Therefore, although patients with ocular hypertension and POAG experience the same change in pore size with age as healthy patients, because of the reduction in baseline ciliary muscle tension, they are starting near the bend of the hyperbola. The same age-related change in pore size produces a dramatic increase in intraocular pressure in those patients who have inherited smaller pores and results in ocular hypertension and POAG. The reverse (eg, enlarging the pores with pilocarpine) explains why patients with ocular hypertension and POAG have such a dramatic reduction in intraocular pressure, whereas in healthy patients, pilocarpine only minimally reduces intraocular pressure, as shown in the image below. 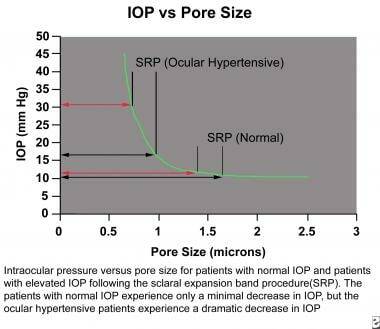 Intraocular pressure versus pore size for patients with normal intraocular pressure and for patients with elevated intraocular pressure following treatment with pilocarpine. The patients with normal intraocular pressure only experience a minimal decrease in intraocular pressure, but the group with ocular hypertension experiences a dramatic decrease in intraocular pressure. The scleral expansion band procedure increases the baseline tension of the ciliary muscle and, thus, increases the pore size. 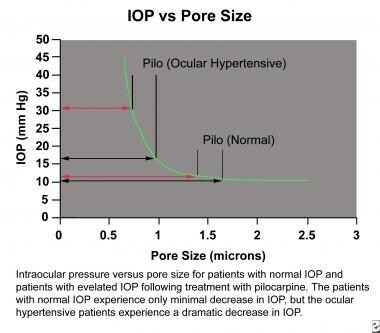 The increase in pore size in healthy patients only minimally reduces the intraocular pressure, but the same amount of increase in pore size dramatically reduces the pressure in patients with ocular hypertensive and POAG, as shown in the image below. Intraocular pressure versus pore size for patients with normal intraocular pressure and for patients with elevated intraocular pressure following the scleral expansion band procedure. The patients with normal intraocular pressure only experience a minimal decrease in intraocular pressure, but the patients with ocular hypertension experience a dramatic decrease in intraocular pressure. Statistical analysis of patients with normal intraocular pressure before the scleral expansion band procedure demonstrates that postoperatively only a minimal decrease in intraocular pressure occurs. On the other hand, 11 eyes with preoperative untreated intraocular pressures of 23-36 mm Hg have intraocular pressures of 13-18 mm Hg without medication 6 months after the scleral expansion band procedure. The scleral expansion band procedure offers the patient with ocular hypertension a new therapeutic modality. This procedure has the advantages of fewer adverse effects and reactions than presently available with ocular hypotensive medications or other surgical interventions, while simultaneously reversing presbyopia. Because the scleral expansion band procedure increases the baseline tension of the ciliary muscle, causing an increase in trabecular meshwork pore size, patients with a predilection for ocular hypertension and POAG should have a significant delay in the development of these maladies. In summary, the scleral expansion band procedure is both a therapeutic and preventive therapy for ocular hypertension and POAG. Schachar RA. Cause and treatment of presbyopia with a method for increasing the amplitude of accommodation. Ann Ophthalmol. 1992 Dec. 24(12):445-7, 452. [Medline]. Schachar RA. The mechanism of accommodation and presbyopia. Int Ophthalmol Clin. 2006 Summer. 46(3):39-61. [Medline]. Davanger M. The elucidation of ocular pressure by means of calculations based on Poiseulle's law. Acta Ophthalmol (Copenh). 1964. 42(4):753-63. [Medline]. Armaly MF. On the distribution of Applanation Pressure. Arch Ophthalmol. 1965. 73:11-18.